The 29th Israel Film Festival honored actress, Dame Helen Mirren, ("Woman of Gold") and screenwriter Aaron Sorkin ("Steve Jobs") at its premiere held Wednesday night at the Saban Theater in Beverly Hills. Aaron Sorkin said, "My friends who are screenwriters tell me that successfully pitching a movie that takes place in the Middle East is somewhere between very difficult and impossible. The reaction from the studios usually is 'that's a good story but who right now wants to see a movie set in that part of the world?' - I do. I want to see a lot of them". 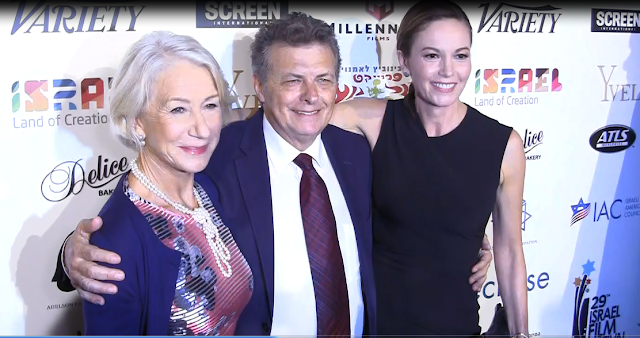 Ms. Mirren recounted that starred in the remake of the great Israeli film "The Debt" adding "I'm so impressed by the incredible Israeli film industry and very excited to see the films that are showing here. I love Israel; I think it's a great country. I think that through all the difficulties and all the pain that Israel has suffered in the past and will in the future, the great thing that Israel has is Israelis and they will guide it through." Earlier this year, the actress starred in The Weinstein Company’s "Woman in Gold" as Maria Altmann, the Austrian-American Jewish woman who successfully reclaimed artist Gustav Klimt’s art owned by her family and confiscated during the Nazi occupation of Austria in WWII. E. Randol Schoenberg, the film's depicted attorney told JewTube, "Woman of Gold is being shown at the Israel Festival. I'll be at one showing. It already opened in April and it's the most successful independent film of the year, so far. They wanted to include it in the Festival and I'm very happy. We have Helen Mirren here today, so it's a real celebration of the movie, I think." Ms. Mirren said she agreed with prominent British figures who signed an open letter, published in The Guardian last week, that endorsed cultural engagement with Israel rather than a cultural boycott, as a way to promote peace between Israel and the Palestinians. 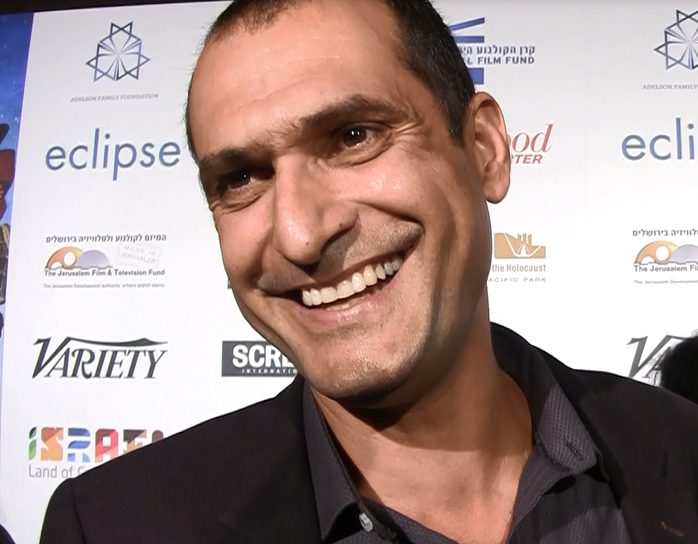 Yuval Delshad, Persian-Israeli Director of "Baba Joon"
of director Yuval Delshad’s Baba Joon, Israel’s official Oscar submission for the Best Foreign-Language Film category this year. Other notable films set to be screened during the festival include Academy Award nominated live-action short Aya and Israeli TV powerhouse Keshet Broadcasting’s docu-drama Sabena Hijacking – My Version. Several cast-members of the Israeli Ophir (Oscar) Award-winner, Baba Joon, joined director, Yuval Delshad on the red carpet for the Saban premiere on Wednesday. More than 80% of the programming is either Ophir nominees — the Israeli equivalent of the Oscars — or winners such as "Censored Voices," which took the top documentary prize. "It's a little bit controversial but powerful," said Fenigsten. "It's about the Six-Day War — things nobody knows happened." Amir Wolf's "Fire Birds," a drama about a police detective who is assigned a case of a murdered Holocaust survivor. Oded Raz's "Galis: The Journey to Astra," a sci-fi adventure based on a popular Israel miniseries. Elad Keidan's "Afterthought," an existential comedy that earned the top prize at the Haifa Film Festival. "Fauda," a popular 2015 TV series that examines both sides of the Israeli-Palestinian conflict. Many of the directors, including Yuval Delshad, Wolf and Keidan, as well as producers and actors, will also be on hand after the screenings to participate in Q&A's. The Israel Film Festival will run its first week at the new Ahrya Fine Arts Cinema off La Cienega Blvd on Wilshire; through Thurs, 5 Nov (see parking info below). The Festival then moves to West L.A.'s Laemmle Royal Cinema from Thurs 5 Nov through Thurs 12 Nov.
On the 12th, the Festival will move to the San Fernando Valley at the Laemmle Town Center in Encino. It also will simultaneously run in North Hollywood at Laemmle NoHo Cinema from Saturday 14 through Thurs 19 November. See Israel Film Festival website for times and tickets. Also, The Israel Film Festival will sponsor a booth at the American Film Market in cooperation with the various Israel Film Funds, and will host exclusive industry events. This is a new initiative to position the Israel Film community as part of the world-wide market place, a move that will allow maximum exposure, networking and business & investment opportunities between buyers and sellers from the Israeli and International Film & Television industries. Please note, both of the parking lots for the Beverly Hills Ahrya Fine Arts Cinema are located near Gregory Way, a walk of approximately 1/4 mile from the theater, so please allow yourself 10-15 minutes extra walking time after you park. First 2 hours FREE, then $1 per 1/2 hour. Gate closes at 11pm. There is only limited street parking around the theater. Limited-mobility attendees might consider getting dropped-off adjacent to the Cinema at Ruby's Restaurant, enabling the driver then drive down towards Gregory Way and walk back.